This is the first in a series of three posts exploring the tart shown on the front cover of Rosetta Costantino’s Southern Italian Desserts (Ten Speed Press, 2013): I’ll start with the pastry itself — a standard Italian short-crust pastry used for all of the tarts in this cookbook — and then follow up with the filling (which can also be served as a dish in its own right) and the construction of the tart itself. Costantino cautions that there is no one true Italian sweet pastry dough; the exact proportions and flavorings vary from baker to baker. Her pasta frolla, however, is not all that dissimilar to Joanne Chang’s pâte sucrée: both are enriched with egg, have no added water, and come in single- and double-crust variations. 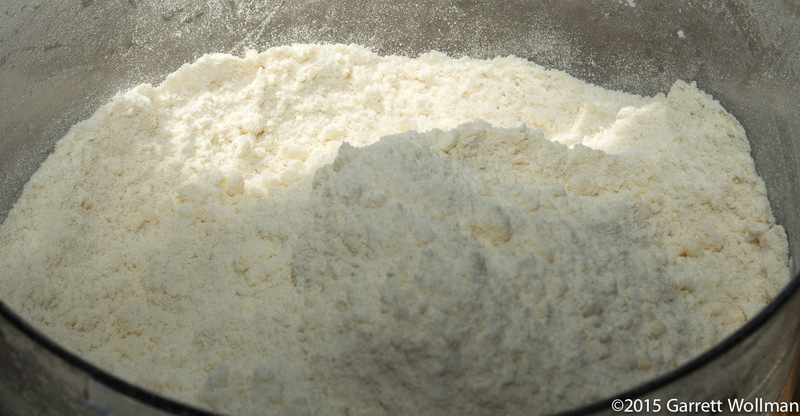 Costantino’s pastry has significantly more sugar, is flavored with fresh lemon zest, and includes baking powder; while Chang uses a stand mixer to incorporate the butter, Costantino uses a food processor. Let’s look at pasta frolla in a bit more detail. This is our standard mise en place for pastry — the butter is staying cool in the refrigerator — but you’ll notice that there is quite a lot of sugar in this dough, a full 150 grams for a double-crust pastry. There’s also quite a bit of flour (more than any of the other double-crust pastry doughs I’ve presented), 400 g, and full stick and a half (170 g) of butter. We round out the dry team with a half-teaspoon of salt and a half-tablespoon of baking powder. 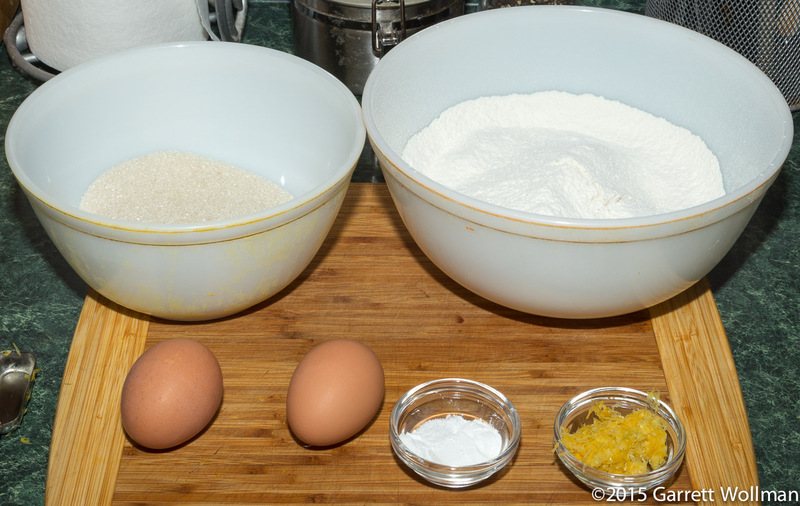 The two eggs are beaten together with a half-tablespoon of lemon zest (about one lemon’s worth). I first whizzed the sugar alone in the processor, which breaks the crystals up a bit (although not quite as finely as true superfine sugar), and then added the other dry ingredients and pulsed a few times to mix everything thoroughly. 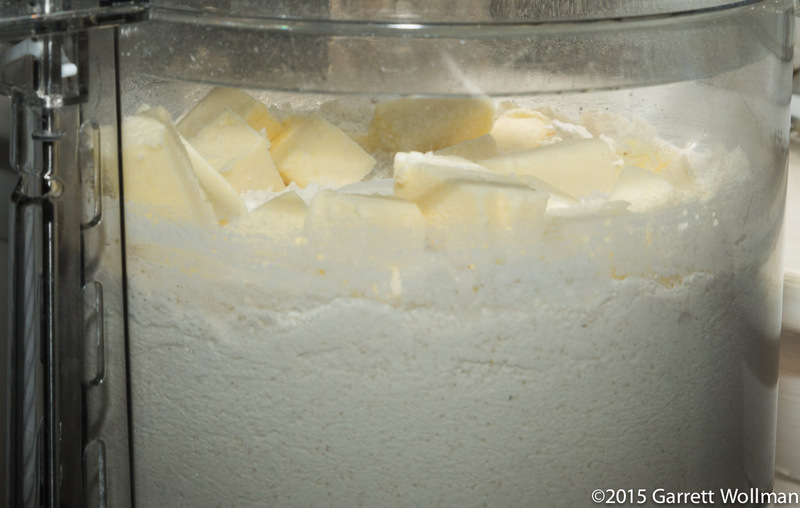 The cold butter, already cut into pieces, is then cut into the dry ingredients. Costantino says to “pulse until the butter is in small crumbs”; this is a tender “short crust” pastry, rather than the flaky sort of pastry American bakers usually favor, so large chunks or flakes of butter are not required. 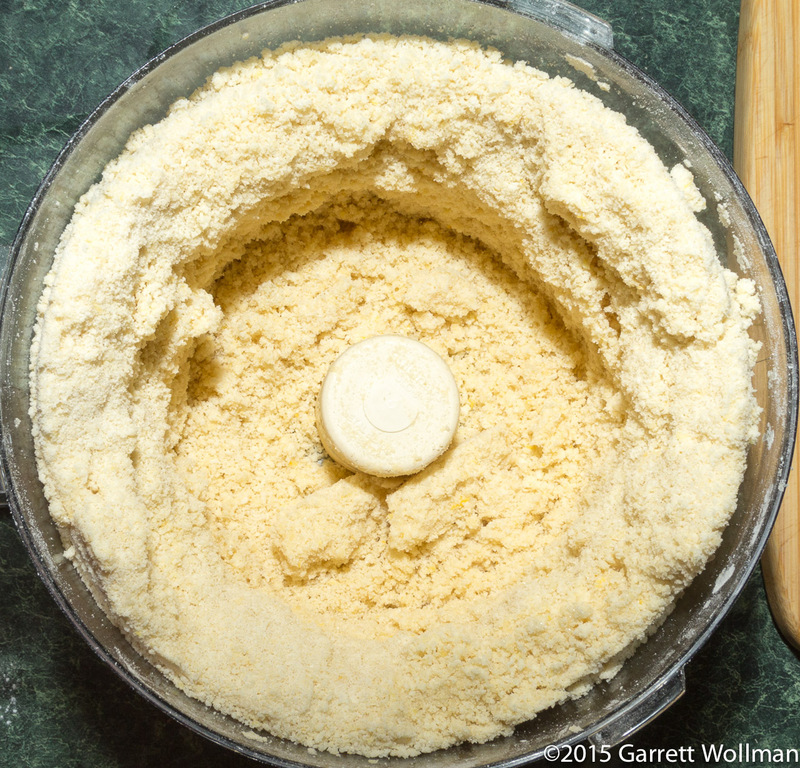 After the butter is fully cut in, the lemon zest and beaten egg mixture is then poured into the running food processor to form a dough. Costantino says “until the mixture comes together around the blade”, but as you can see from this photo, that wasn’t going to happen in my food processor — with these ingredient quantities, the double-crust dough barely fits into my processor’s work bowl as it is, and there’s no room for it to ball up. (Contrast the pâte brisée from Four & Twenty Blackbirds that I’ve covered before, where a double batch fits easily in the same processor: more butter, less flour, almost no sugar.) Although this looks quite loose and crumbly, when formed into a ball it will hold together quite easily. I weighed out the resulting pile of pastry at just over 810 grams. For the next step in this recipe (covered in the third post in this series), the instructions said to divide the dough unevenly, so I made one disc of 350 g and the second with the remaining 460 g. Both discs were then wrapped tightly in plastic wrap and refrigerated for a couple of days. As usual, I present pie-crust nutrition on the basis of eight servings per pie. Note well: Costantino’s single-crust recipe is two thirds, not half, of the double-crust recipe. This entry was posted in Food and tagged pie crust, pie dough, recipe, Rosetta Costantino. Bookmark the permalink.